Home of the Chicago Bears, Soldier Field was once the oldest stadium in the NFL. To honor World War I veterans in 1919, plans were developed for a new stadium. Construction began on the stadium in 1922 and was completed by 1928. Opening for the stadium, that was originally called Municipal Grant Park Stadium, came on October 9, 1924. Less than one year later the stadium was renamed Soldier Field and was officially dedicated on November 27, 1926. The stadium was modeled after ancient Greek and Roman stadiums. The most distinctive feature of Soldier Field was the pair of systole colonnades perched along the parallel east and west sides. Each colonnade, flanked by tetrastyle temples, was formed by a double row of 32 columns. Soldier Field could host many events from football to bike racing. When the stadium was finally completed it had a capacity of near 74,000 and was in the shape of a U. Additional seating could be added along the interior field, upper promenades and on the large, open field and terrace beyond the north endzone, bringing the capacity to over 100,000. In 1939, the north end of the stadium was closed off, with the addition of the Chicago Park District’s headquarters. The largest crowd for any event at Soldier Field was 260,000 on Sept. 8, 1954 for the religious Marian Year Tribute. From the Chicago Bears inception in the early 1920s until 1970, the team played at Wrigley Field, home of the Chicago Cubs. After the 1970 season, the team decided to move to Soldier Field. On September 19, 1971 the Bears played their first game at Soldier Field. The capacity of the stadium was reduced to 57,000 to bring fans closer to the field. In 1978, Astroturf replaced the natural grass field and the seating areas were rebuilt. By 1981, additional seating was added bringing the capacity to 66,000. New luxury suites, a press box and a video/scoreboard were also added. In 1988, the Astroturf was replaced by natural grass and 56 luxury suites were added to Soldier Field. 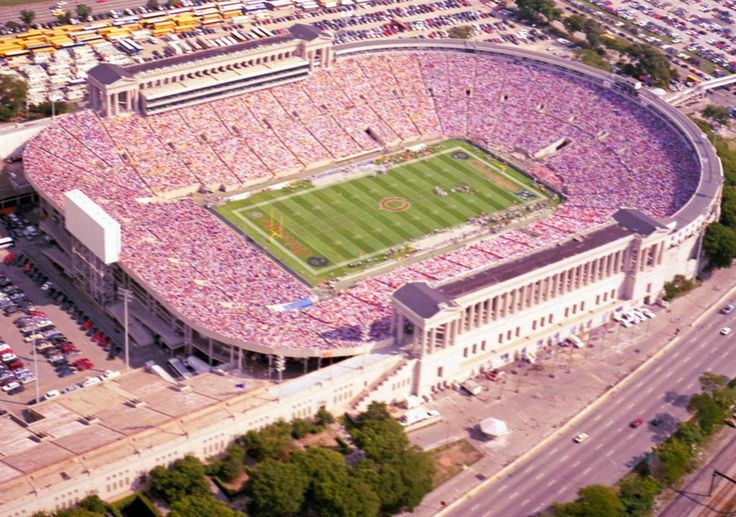 In 2000, the Bears announced that Soldier Field would be completely renovated and expanded as part of Chicago’s Lakefront Improvement Plan. As part of a $365 million reconstruction project, the majority of Soldier Field was demolished with the exception of the exterior. 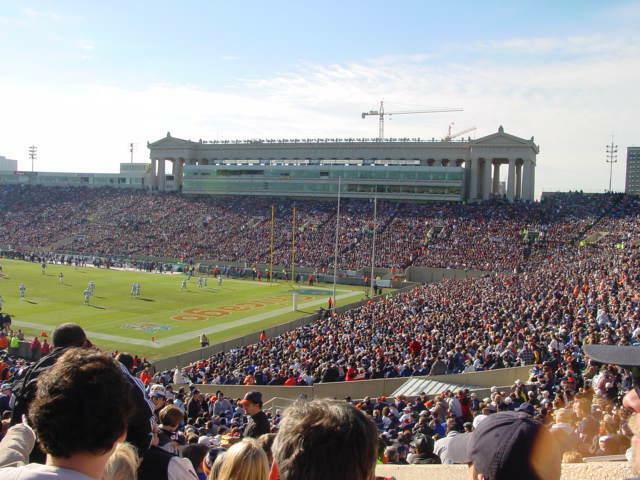 While Soldier Field was reconstructed the Bears played at Memorial Stadium in Champaign, IL throughout the 2002 season. The new Soldier Field has around 66,000 seats in several tiers, overall improved seating, better sightlines, an enlarged concourse, two 96-foot-by-23-foot video-boards, 8,000 club seats and 133 luxury suites. To preserve Soldier Field, the classic colonnades were saved intact as a lasting monument to Soldier Field’s glorious past and a 250-foot granite-wall sculpture serves as a memorial to the men and women who served in the armed forces. Fans are able to walk among the colonnades and the horseshoe promenade. The Bears moved back into the new Soldier Field in time for the 2003 NFL season.